Get ready to win your share of $3,000 Dungog Dollars. 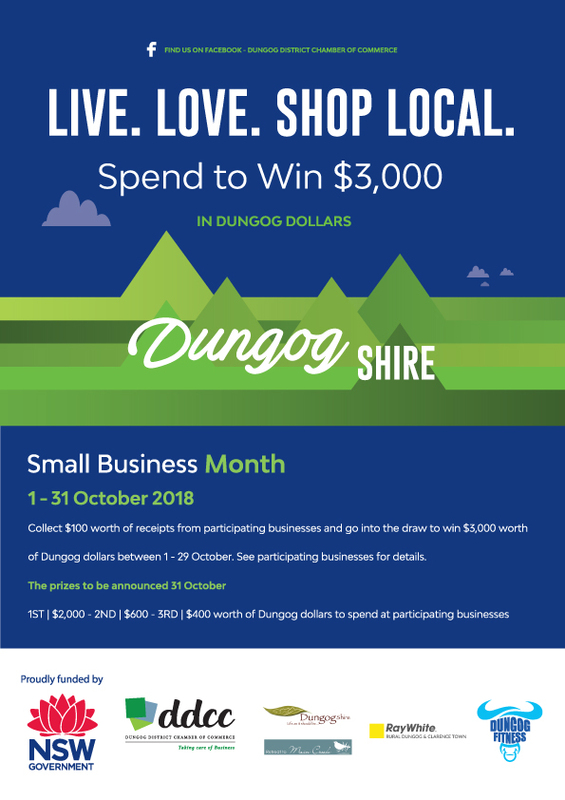 During the month of October Dungog District Chamber of Commerce in conjunction with Dungog Shire Council and part of the NSW Department of Industry Small Business month, our LIVE. LOVE. SHOP LOCAL campaign will offer you the chance to win Dungog Dollars by shopping at participating business. Simply collect receipts between Monday 1 October and Monday 29 October to the value of $100 and place them in the envelopes in stores. Winners will be drawn on 31 October. For further details, please click on the images to the right, or click on the button to download to your computer. DUNGOG SHIRE IS DEFINITELY OPEN FOR BUSINESS! Congratulations and many thanks to the more than 50 businesses and organisations who participated in our Expo. What a fantastic display of enthusiasm, community spirit and collaboration you have showed! We would also like to thank the more than 150 visitors who took the time to see what our business community has to offer and to show their interest and support. The event was presented by the Dungog District Chamber of Commerce in conjunction with Dungog Shire Council and the Dungog Regional Tourism Inc. and sponsored by the NSW Department of Industry as part of “Back to Business Week”. Westwood Dungog Providores who provided a sausage sizzle for exhibitors and guests. Allan Woo, Airlines and Partnerships Manager from Newcastle Airport who spoke about plans for expansion of the Newcastle Airport and the potential benefits for tourism in the Dungog Shire. Dungog’s own Ukulele group who entertained the crowd. All those businesses and organisations who donated almost 20 very generous prizes including vouchers at local businesses, dinner and meal vouchers together with one and two night stay accommodation vouchers and a fabulous tablet donated by Telstra. Watch our video and meet some of our wonderful businesses! DUNGOG SHIRE ATTENDED THE 2015 COUNTRYNSW EXPO ON SATURDAY, 1 AUGUST TO SUNDAY, 2 AUGUST 2015 AT THE HOWIE COMPLEX, SYDNEY SHOWGROUND, SYDNEY OLYMPIC PARK. Following the flood/storms that affected the area in April this year Michael Johnsen, MLA, Member for the Upper Hunter facilitated Dungog Shire having a complementary stand at the 2015 CountryNSW Expo. Over the last few years our Council had participated in the Expo but in a consortium with other Hunter Region Councils. Attendance at the Expo was a partnership between Dungog Shire Council (including the Dungog Shire Visitor Information Centre) and Dungog District Chamber of Commerce (DDCC). The stand contained posters showcasing the area, various promotional materials from businesses in the Shire and a pack with information about local real estate, job advertisements, a copy of the local Telephone Directory, contact details for local pre-schools, primary and high schools and colleges, train times, information about upcoming events, copies of the Dungog Chronicle and local community papers, and maps of the area. On Sunday, 2 August the Member for the Upper Hunter Michael Johnsen also assisted with staffing the stand. An Expression of Interest has been prepared outlining how Dungog Shire meets various criteria (within three hours of Sydney, water and power availability, B-double access etc) for the establishment of a mushroom farm in the area. This lead was provided by the organiser of the Expo and our Expression of Interest included a letter of support from the Member for the Upper Hunter. See our flyer with case studies about new and expanding businesses in the Dungog Shire in the right column.